If you’re one of the 2.6 million duck or other migratory bird hunters in the U.S., Brewster Belt Company would like to extend an offer to you. 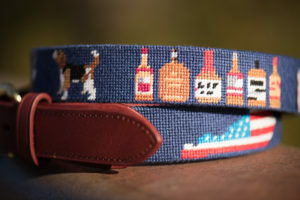 From now through the end of 2016, Brewster Belt will donate 25% of the purchase price of any custom needlepoint belts, flasks, wallets and dog collars with a hunting design to Ducks Unlimited. Simply request the “hunting donation” when you place your order. 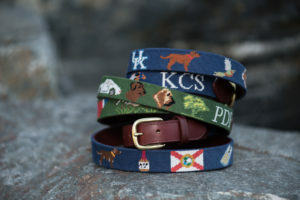 Brewster Belt will donate 25 percent of purchase price to Ducks Unlimited conservation efforts. It might sound counterintuitive, but many duck hunters are also conservationists and have directly or indirectly contributed to protecting and preserving natural resources and wildlife habitats. Duck hunting and other bird hunting has been regulated in North America for 100 years. In fact, 2016 marked the 100-year anniversary of the signing of the Migratory Bird Treaty, an internationally recognized commitment to protect and conserve migratory birds. In the U.S., migratory bird hunters contribute to conservation efforts when they purchase Federal Duck Stamps, which serve as both a hunting license and conservation tool. Brewster Belt also offers custom hunting dog collars for your favorite canine friend. Since 1934, more than $850 million has been raised through the sale of Duck Stamps and the funds have been used to help acquire and protect more than 6.5 million acres of land. In addition, one of the nation’s largest conservation organizations, Ducks Unlimited, got its start in 1937 during the Dust Bowl when North America’s drought-plagued waterfowl populations had plunged to unprecedented lows. Since then, Ducks Unlimited has conserved more than 13 million acres of wetlands and other wildlife habitats. 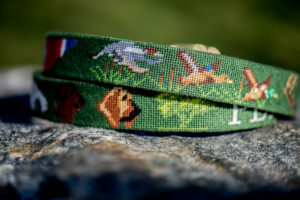 Show your support for these conservation efforts and your passion for duck and bird hunting with a custom hunting needlepoint belt, dog collar, flask or wallet. All items can be customized with any design, colors, images and monograms. Mention the “hunting donation” and 25% of your purchase price will be donated to Ducks Unlimited.